How to end decades of poor bowling green performance. Do you ever think that its just impossible to get your bowling green playing the way you want it to on a consistent basis? Its true that most greens sometimes hit a sweet spot for at least a week or two most seasons. Those days when things don’t seem like they could be any better don’t usually last for long on most UK greens, but this doesn’t have to be the case. Its soul destroying to see the green true and fast and running perfectly …and then boom!, without any notice its back to its old self again, patchy, bumpy and unpredictable. Previously perfect rinks seem to have been destroyed over-night and they are now playing like the worst green you’ve ever had the misfortune to play on. Worse still, this always seem to happen just when you have a big tournament or a very important visitors team coming at the weekend…it can be very embarrassing indeed. Well…you are not alone, your club is not unique in this respect. Most clubs in the UK experience this kind of frustration year in year out. It doesn’t seem to matter what you try to do to get over it, the green seems to perform well on fewer and fewer occasions each year. Would it surprise you to know that this is almost entirely attributable to the maintenance you do on your green and even worse; the very expensive maintenance that you employ “expert” contractors to do for you every year? The truth is that the majority of bowling greens are being subjected to maintenance practices that are just wrong and are in fact making bowling greens worse. This kind of maintenance is moving your green further and further away every year from ever being a high performance and reliable green. That’s where Greenmaster’s expert bowling green maintenance service comes in. We have experienced this problem on hundreds of different bowling greens and we have the knowledge, tools, techniques and resources to reverse decades of inappropriate maintenance practices with our targeted maintenance programs, specialised equipment and expert staff. We regularly visit greens where there are problems with flooding, moss, thatch, bumpy surfaces, bare patches, unreliable rinks, dry patch, slow playing surfaces and all manner of other issues. Most greens are in an unhealthy state and need to be revived through the application of the correct maintenance regime, products and above all else…knowledge. Bowling clubs are increasingly facing stiff competition for their previously loyal member’s pounds (£). To maintain a healthy membership, clubs must provide great playing surfaces at lower cost than they are used to paying. At the same time, many clubs are stuck in a rut of blindly applying out-dated maintenance practices which are actually making their greens worse instead of better. take away Health and Safety and Pesticide Legislation compliance worries. Increasing performance, financial and legislative demands on bowling clubs are making it very difficult for them to deliver and maintain high performance bowling surfaces. Greenmaster provides a comprehensive package of bowling green maintenance services designed so that your club can have a high performance green at an affordable price. We take away all of the difficult problems that arise as a result of health and safety regulations, pesticide legislation and deliver highly focussed bowling green maintenance services using the latest and most advanced machinery and techniques and performance proven and environmentally friendly bowling green treatments. Bowling Green Maintenance is a very specialised area of work and makes up a significant proportion of what we do at Greenmaster. In addition to the regular issues associated with turf maintenance Bowling Green Maintenance throws up a lot of challenges for clubs and for this reason we have developed a Performance Focused approach to Bowling Green Maintenance. 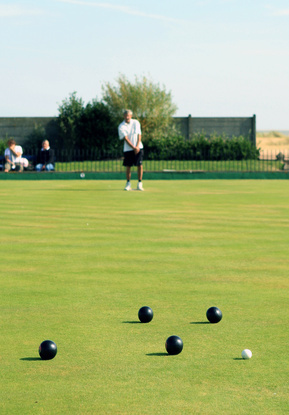 Bowling clubs often encounter a range of problems within the maintenance of their greens due to the complex nature of the average bowling green. Problems such as thatch and compaction can not only cause problems with slow and bumpy greens but can also have a knock on effect in creating further maintenance and performance problems such as Localised Dry Patch which causes large areas of the green to become water repellent in mid summer and leads on to an uneven surface for much of the remainder of the season. Other problems associated with bowling green thatch and compaction include wet and soggy green surfaces that slow down the bowls and make rinks unpredictable and frustrating for players. Thatch can also encourage disease outbreaks on the green which can devastate the green surface just when you can least afford it. Other issues such as weed infestation, moss growth, flooded rinks and general poor turf health can occur as a result of not dealing with the build up of thatch and compaction on the green. In addition to the practical, greenkeeping issues faced by clubs, there is also the increasingly onerous legislative demands on clubs to comply with pesticide legislation and health and safety rules and training requirements for staff. Insurance and facilities requirements can also add a further burden to clubs already trying to get by on a tight budget. Keeping an up to date fleet of machinery suitable for maintaining a bowling green at optimal performance can also create cash and investment demands on clubs that are difficult or impossible to meet. All of our bowling green maintenance recommendations are based on a thorough inspection and therefore understanding of your needs and current condition of your green. We focus only on performance, making sure that your green performs the way your members expect and that it stands as a marketing tool for your club to help attract additional users and members. Wherever possible we use natural, organic products and we focus on dealing with the root cause of problems instead of continually reacting to symptoms, which has become the major problem in bowling green maintenance around the UK. We create a program for your green that is comprehensive and doesn’t just focus on the work needed in-season. We carry out work all year round on your green to make sure that the maximum benefit is gained from the close season in order to present your members with a high performance green right from opening day forwards. All of our staff are fully qualified greenkeepers with at least 10 years experience and are fully certificated for the application of pesticides and other products. We have a rigorous training program that ensures all health and safety requirements are taken care of by us, leaving you with no worries about compliance with current or future legislative demands. Greenmaster delivers a complete and high quality bowling green maintenance service across the Central belt of Scotland. Our initial consultation is always free and we provide you with a comprehensive action plan to help you to achieve a high performance bowling green and to keep costs under control along the way.